Parkway Drive say their upcoming sixth album will show a definite progression in the band’s sound – but will also be more aggressive than previous material. 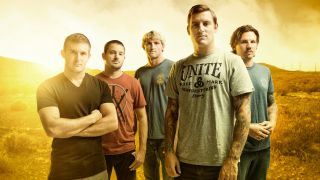 The Australian outfit report that they’re 70% through the follow-up to 2015’s Ire, with frontman Winston McCall hinting at what fans can expect when the as-yet-untitled album is released. He tells MoreCore.TV: “It’s a bit of everything – I think the best way to describe it is new flavour. It’s refinement. “I think ideas that we’ve had in the past – we’ve now gone even further with new ideas. But things that we have always loved about the band, we’ve just made sharper and more aggressive and have more impact and more statement to them. Parkway Drive have several live dates scheduled across the US this summer, kicking off with an appearance at Cincinnati’s Bogart’s on June 20. Find a list of the band’s tour dates below.